Acquired from celebrated vendors and sources, the Bike Seat Cover Net Type is known for its elegant design, alluring appearance and high comfortable level. 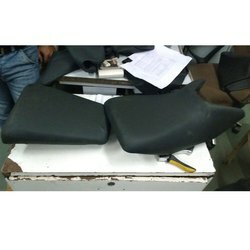 By keeping our sync with the advancements taking place in this industry arena, we have been engrossed in the realm of presenting quality assured Vheelocity Two Wheeler Seat Cover / Rexine Bike Seat Cover. 1. The cooling cover is designed for typical motorcycle brands common in Asia. 2. The cover allows air to flow through the mesh and creates space between the rider and seat. This allows the air to cool the rider. In order to keep pace with the never-ending demands of customers, we are involved in offering a wide range of Black Seat Cover.